PHILAESTHETIC returns! This year marks the 400 year anniversary of the arrival of Africans to the colonies that would become the United States – bringing with them a rich cultural tapestry that would shape the foundations of our country, and continue to influence creative expression around the globe. 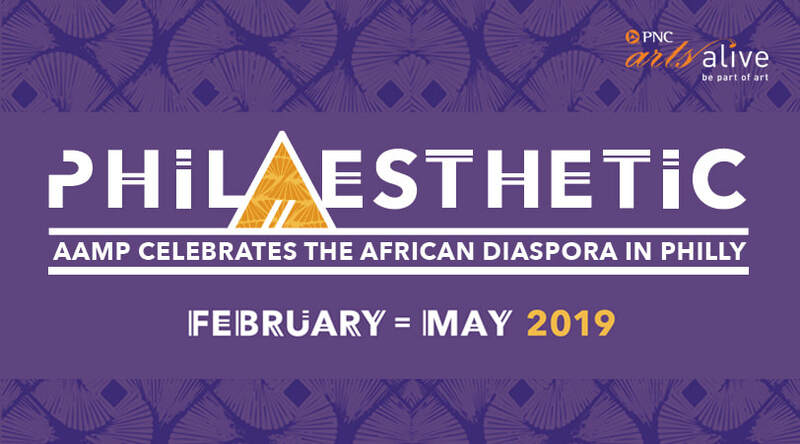 The African American Museum in Philadelphia (AAMP) invites you to join us as we explore the global influence of Black art, culture and traditions with PhilAesthetic: AAMP Celebrates the African Diaspora in Philly! Funded by PNC Arts Alive, and curated by AAMP, PhilAesthetic shines a light on the breadth, depth and vitality of diasporic expression here in Philadelphia, and beyond. Anchored by two stunning new exhibitions at AAMP, and more than a dozen innovative programs held at the museum and with partnering institutions around the city, PhilAesthetic opens a window for people of all backgrounds to celebrate the undeniable energy and spirit of Black creativity. PhilAesthetic kicks off with a performance by Kulu Mele African Dance and Drum Ensemble, and the 23rd Annual Schomburg Symposium, both held at Taller Puertoriqueno in North Philadelphia. Other highlights include two documentary screenings with filmmaker discussions, monthly Macy’s Family Fun Day celebrations, and evening concerts presented in partnership with AfroTaino Productions and the University of Delaware. PhilAesthetic culminates with a free, outdoor African music festival presented in partnership with the African Cultural Alliance of North America, currently slated for Sunday, May 26th. You can use the above tabs to navigate and learn more about PhilAesthetic at AAMP!